In late June, fishing buddy Doug invited me to the 2010 annual “Trout Camp” weekend on the banks of the Au Sable River. The Au Sable, which in French literally means “with sand,” drains the northeastern basin of Michigan’s Lower Peninsula and empties into Lake Huron. The river and its tributaries boast some of the best brown trout fishing east of the Rockies. 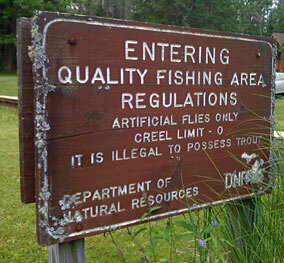 Special regulations placed in many areas along the Au Sable River system protect Michigan’s trout populations. A few miles east of Grayling the river flows past Burton’s Landing, marking the fly fishing only, catch-and-release section also known as the “Holy Water.” This area extends for nearly nine miles downstream to Wakeley Bridge. We were fishing during the tail end of the hex hatch and did not experience the numbers we were hoping. In fact, we brought in a small number of 6″ to 8″ brook trout. The only real luck I experienced was using Caddis flies, which hatch all summer. There is not much more relaxing than standing in the middle of a beautiful river, feeling the flow and compression of the water around you.